Home > News > Can Liverpool end 7 year Chelsea hoodoo at Anfield? The Premier League nears the end of yet another enthralling season, with everything on the line. The Chelsea Liverpool game encapsulates this last-minute rush for all things memorable. Liverpool are chasing a first Premier League title while Sarri’s Chelsea gun for that precious Champions League spot. Chelsea, whose manager seems to be under constant scrutiny, sit comfortably (or as comfortable as it gets in the PL) 2 points clear of Manchester United. Liverpool are in a similar position, with the slightly added expectations of a mad city in the north. There is a lot more context that exists in this game. On Sunday, Liverpool’s title-chasing rivals Manchester City play away to Crystal Palace, in a way recreating the 34th matchday of the 2013/14 season. On that sunny day in the spring of April 2014, the studs of a certain individual from Liverpool had a little too less friction which resulted in one of the more iconic goals of the Premier League era. Chelsea forward Demba Ba ran through and slotted away both the goal and Liverpool’s title hopes. The imprint of that day is a deep wound in the minds of Liverpool fans that can be healed by a convincing result in the upcoming fixture. Then there is the added racism perspective that lingers over this match. A sad thing, it is. Across the years, this is fixture has been a fiercely contested one. Chelsea have a stellar record at Anfield, having not lost there since 2012. They also have a knack of derailing title contenders, being the kingmaker, when they are not in the reckoning for the title. Liverpool, on the other hand, will be taking heart from the fact that they have extended their unbeaten run at home in the Premier League to 37 games. They feel untouchable at their fortress of a stadium, digging out wins in from the most dire situations. The game is expected to be a fast bout with both teams trying to go for the kill in the opening half. Chelsea, with Eden Hazard, will look to advance on their left, using his pace and skill to drag the Liverpool full-back out of position. It is certain whoever plays right-back for the Liverpool defence will have their task cut out. Chelsea will be expected to line up in their usual formation, a 4-3-3, with Higuain leading the line. The left-back position seems to have been taken up by the Italian Emerson. He certainly brings some stability to the position while also offering to be an option in attack. The midfield will be one to ponder for Sarri. He has had Kante and Jorginho as two constants throughout the season, with the third spot being rotated. It will be interesting to see if he goes with an attacking mindset and plays someone like Barkley, who has some experience of playing in the Merseyside derby. 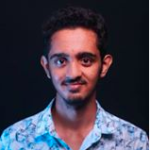 That third midfielder could well decide which way the match swings as he will be up against the tenacious Fabinho, who will most probably be preferred as the deepest midfielder for Liverpool. In this Liverpool squad, his reading of the game is almost divination-like, rivaled only by Virgil van Dijk. With his long reach, he provides the much-needed breaks in play, thwarting opposition counter-attacks, which will be imperative when he comes up against Hazard. Liverpool will look to be direct in attack, as they have done so in the big games this season. 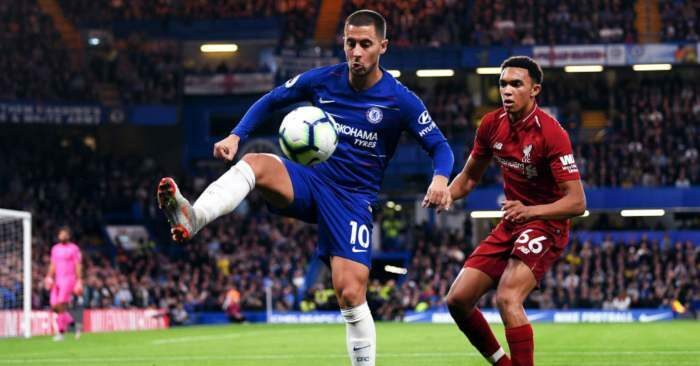 Hazard’s notorious disability to track back should favour the Liverpool full-back in attack and they are fully expected to add to their tally of a combined 16 assists. Roberto Firmino will try to start out the game supporting Salah and creating an overload in the right-hand side. 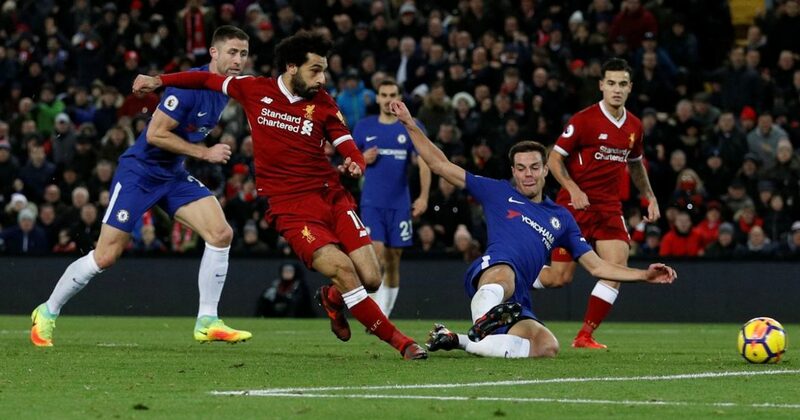 Salah will look to capitalise on moments of indecision by the Chelsea midfielders, especially Jorginho. These moments of indecision will have to be engineered by the Liverpool front three, using their quick combination and movement. The Brazilian duo never share a more than an amicable moment when playing for their respective clubs, not afraid of going full throttle at each other. This battle will be an interesting one as Firmino will once again look to shape Liverpool’s play in the attacking third while Luiz will look to stop him doing so with his aggressive nature. 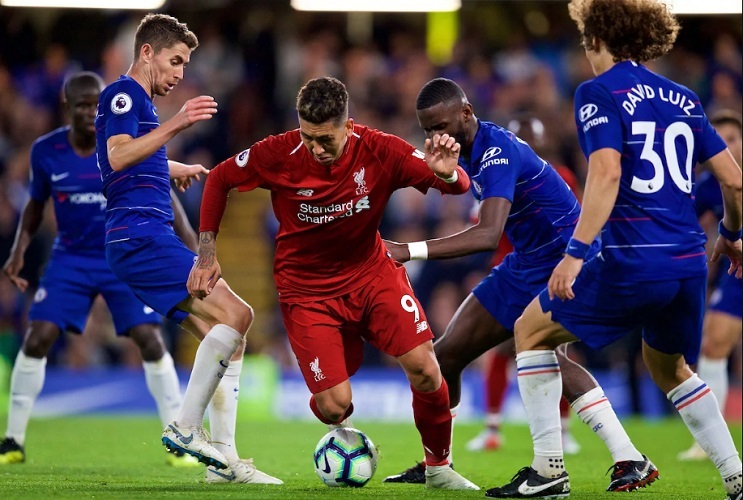 Whether or not Firmino is asked to mark Jorginho like he was placed on Fernandinho against Manchester City, could decide the outcome of this battle through the center of the play. The marksman has been on and off during his time at the Bridge, scoring goals but coming up short in terms of his link-up play. He will look to evade van Dijk using all his guile and experience. Having trained with the likes of Ramos, Bonucci, and Mascherano should hold him in good stead for this battle. Virgil van Dijk will try to be alert to his cute turns and will look to restrict shots from the Argentinian. Stopping him will weaken a major threat to Liverpool and starve Hazard of anybody to link up with, a tactic other teams have employed successfully. Arguably the most influential attacking player in this Premier League season, Eden Hazard has proved time and again that he is the force that pushes this Chelsea team forward. He will be up against young Trent Alexander Arnold, whose progress in the last 3 months has been overshadowed by a challenge for the Premier League title for Liverpool. The young Liverpudlian can now be relied upon to be able to handle a pass under pressure from an opposition player, something he was not privy to last season. He struggled in the opening parts of this season but has regained his composure and has been influential in the second half of the season. Trent, if selected, will have clear orders to not let Hazard cut inside the left channel to disrupt Alisson’s clean sheet. Once on that lethal right foot in space, it is only prayers that can stop Hazard. Trent will look to capitalise while Liverpool attack, hoping to be instrumental yet again.